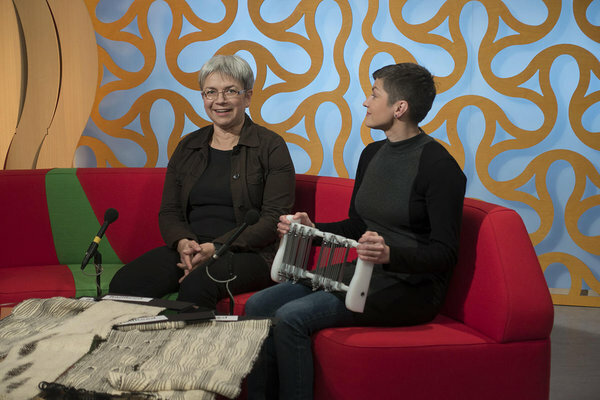 This year themes are warp and weft manipulations with RailReed, jumping warps (warps that change position) and textile structures made with 3D printing. 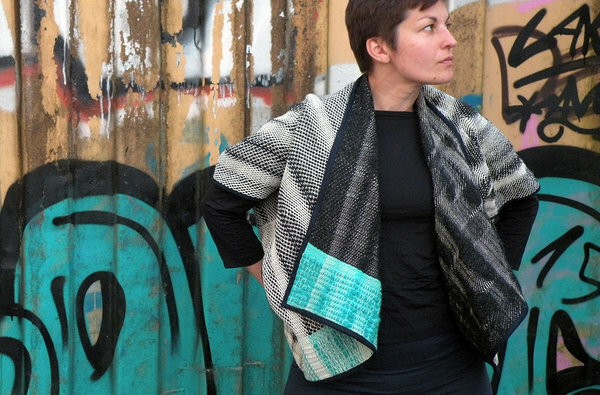 Looking forward to meet inventive weavers. 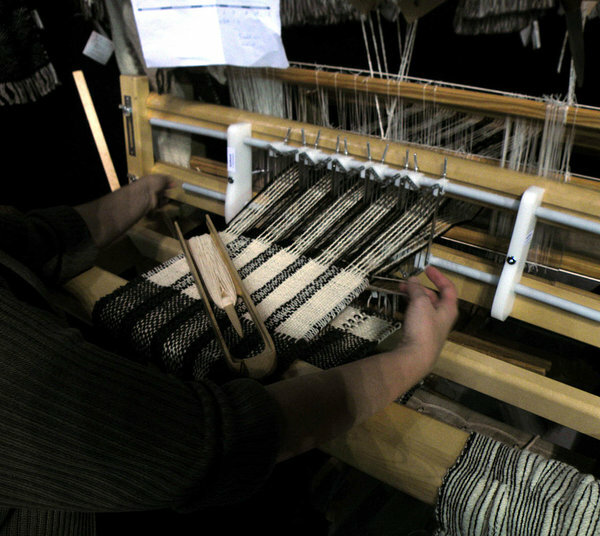 Here are works of Anneli Säre, the weaver who uses RailReed on Saori loom. The challenges she took were the limits of altering fabric width and using shining polyester ribbon as weft. As I hear that the beater of Saori loom has very narrow slots for the reed I made two pieces of metal with holes instead of the wood blocks we use for normal floor looms. RailReed must be attatched quite low, not to get into the way of shed forming. We threaded the cotton warp so that every edge slot of the modules had 8 ends and inner slots 6 ends, also we put 5 warp ends between the modules. These kinds of weaves must be gently handwashed. But Anneli said she will use also stripes of carded wool, that should also work well with RailReed and keep the cool waves of warp from straightening. Participants from Estonia, Finland, Lithuania, Germany, Israel. 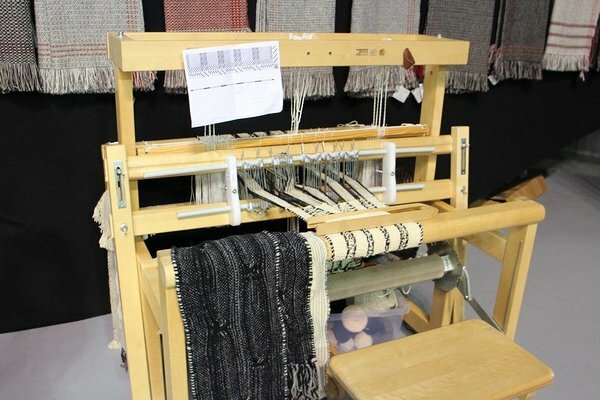 Weaving with rigid heddle modules. I'm sitting in a luxurious glass structure in the SEB headquarters, downing a cup of awful instant coffee and listening to a drowsy lecture on crowdsourcing. The two pieces of candy I took didn't invigorate me in the least. On paper, however, we're developing our product at a lightning pace, both Kadi and I. And so we conclude yet another weekend of brainstorming at Railreed, this time in Tallinn, the eyeball-freezing capital of Estonia. Representing were Kadi, Marilyn, Juula and yours truly. We learned more about how to penetrate and take hold of the US market as well as crowdsourcing, while Sunday was dedicated to the art of creating a brand. We'll be going through yet another weekend of lectures on the 23-24th, which will act as an introductory course to the next round of eliminations, where brave thirty will become the valiant seven. I'm trying to hold back on eating, as there's a very real possibility of us appearing on TV in the near future. Question of the day: If Railreed was a person, who would they be? Male or female? Young or old? Proud and prestigious or a perceptive patrician? A seminar took place on Saturday, where a truly badass start-up introduced their business models through the principles introduced by iEngine and Lean Startup. The day was led by Alar Kolk, the founder and leader of the European Academy of Innovation (http://inacademy.eu/). All-in-all a very intense and enjoyable day. Taking part in an event led by such a charismatic and knowledgeable individual was truly an honor. Kadi and Marilyn were unfortunately unavailable due to them being in Berlin and all. That of course doesn't mean that the day was wasted, as we took it upon ourselves to discuss, present and improve ourselves, and later share our findings with them. We constructed a working theory of how we're gonna market our product, including potential clientele and vision. 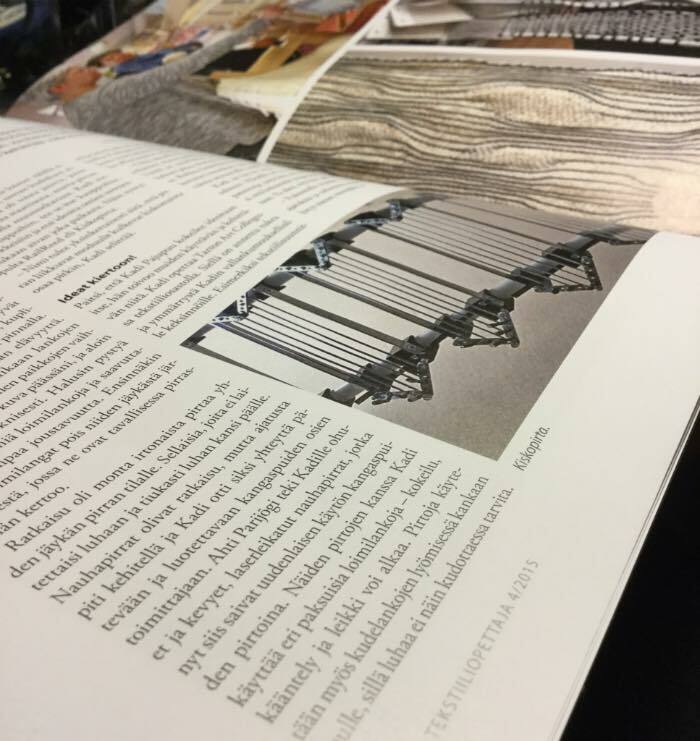 You were probably already aware that RailReed is for the innovative textile artist or hobbyist, whereas those artists and hobbyists probably live in a more rural area, are very up to date on their specialty literature and are very social? I also believe that their homes are already fully decorated with golden-yellow Christmas lights and a very fashionably dressed-up Christmas tree, near which a chair awaits its master, equipped with a weaving zmagazine and a cup of coffee. In practice, this means that RailReed should find some way into textile magazines (done) and some bigger textile blogs (in progress). This of course isn't your job, dear reader, though spreading the word is always welcome. The day ended with the Ajujaht Christmas party. Sunday, on the other hand, was less eventful (one might even say boring). Meaning we started dealing with numbers and bookkeeping. We started researching into the financial side of making a business model. The founder of Eesti Äriinglite Association, Startup Wise Guys, Civitta and many other business startups and investor Riivo Anton talked about teamwork, camaraderie and money. And thus RailReed keeps on marching forward (like its bosom-buddy Stepping reed) and creating its novel and interesting patterns. 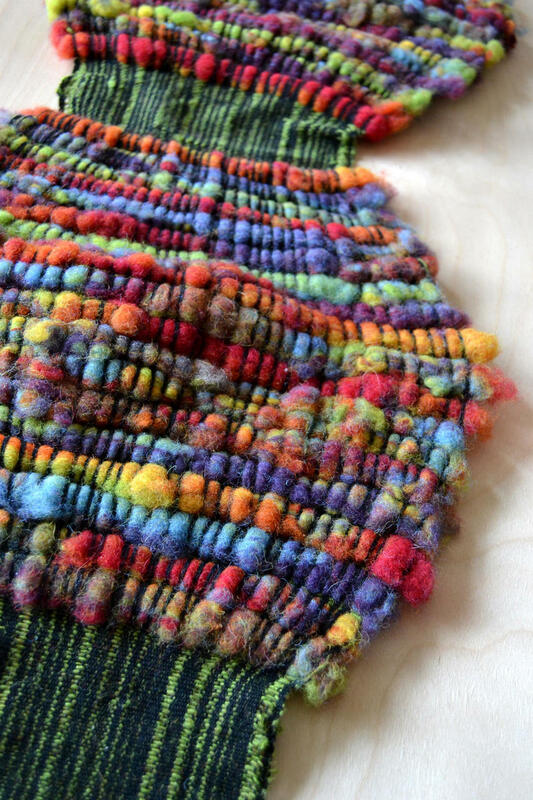 These hands were made for weaving, and that's just what they'll do! 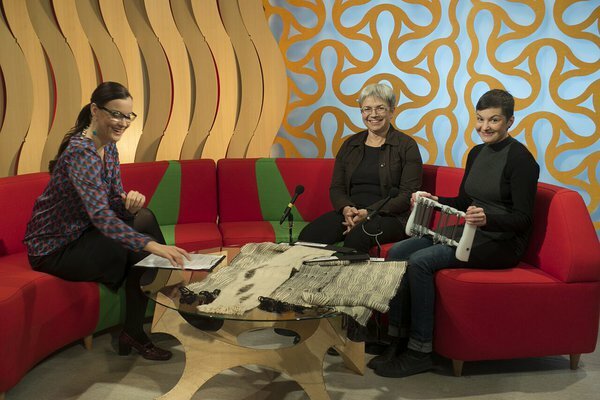 We were invited onto the fairly prestigious early morning TV show Terevisioon. First we were covered with makeup while drinking some coffee. Marilyn drew the better end of the stick, as she was attended to by a seemingly more experienced makeup artist than the rest of us, as their conversation in the chair next to me was all about eyelashes and foundation. My head, meanwhile, was being dunked in something resembling lacquer, which helped keep my hair from spiking up due to anxiety. Looking at each-others' plastic looking faces was the funniest thing I'd seen in a long time. A long conversation with some musicians that had wandered into the room while the hosts were doing their morning routine ensued, leading to many goofy and funny moments. "Look, the weaver can change patterns in REALTIME!" one musician told to his friend. Also, we're now officially selling our product as RailReed Beta, as suggested by Matis during the export lecture. The 28th was a momentous day, as the second round of Ajujaht separated the man-ideas from the boy-ideas. Half of our team presented our idea: The Leonardo-esque inventor Kadi, developer and „We're actually serious about this“ factor Tõnis as well as the world-class wordsmith Anneli. The others were behind the scenes providing moral support. Huzzaa! Turns out you CAN innovate even in traditional fields. The results of this stage will be made public at 16:30, so we're really excited. This of course doesn't mean that we'll be sitting around doing nothing in the mean time. We all have our objectives and assignments, and will be working hard to make it happen. It's late, but I can't calm down. My heart is in overdrive from those three extra cups of coffee and pure adrenaline. Our team attended a lecture on how to pitch products. Funnily enough, even though the lecture itself was in Estonian, they still insisted on using the English word “pitch”. I guess it just sounds more aggressive, like beating someone down or a high-stakes fight to the death. A sales pitch should last no more than 3 minutes, during which you should try to sell your product or idea as convincingly to investors as possible. Digressions and excess cliche sayings should be avoided, while remaining as factual and understandable as possible, without boring the audience. Our team is more than up to the task. We were also introduced to the so-called 'grandma test', where you imagine a fictitious granny and see if she understands your product. This was no obstacle for us, of course, since all grannies are very well versed in words like loom and warp and reed. Them app developers are in a heap of trouble when it comes to weaving. The next round is on the 28th of November, where only 30 out of 100 ideas will pass. The day was jam packed full of interesting opportunities for brainstorming and presenting our product. We heard everyone's ideas and it soon became clear that Kadi's comment of us being the only non-IT developer turned out to be false. Later that day we visited Kadi's studio. A place filled to the brim with things and projects and the mother of all looms. That was probably the most magnificent in-development project I've ever seen, with the exception of RailReed, of course. I won't go in depth here but just try to imagine a simple loom having a child with the Terminator, that child now resides in that studio. We're looking forward to the next round on the 28th, where most of the 100 ideas will be plucked out and only 30 will continue. Even now I can feel my blood pressure rising to dangerous levels. Influential Finnish textile educators Päivi Fernström and Päikki Priha visited my studio. 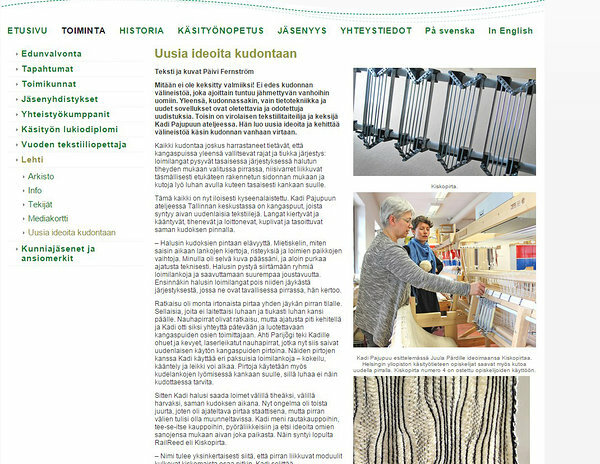 Päivi wrote an article about my inventions to Finnish textile teachers magazine. Article describes truthfully how the inventing process went and points out that I believe in sharing ideas not protecting them. The first meeting at Tartu Art College with my RailReed team started 11.11 at 11 o'clock. Just by coincidence. My team members are people I admire and respect. 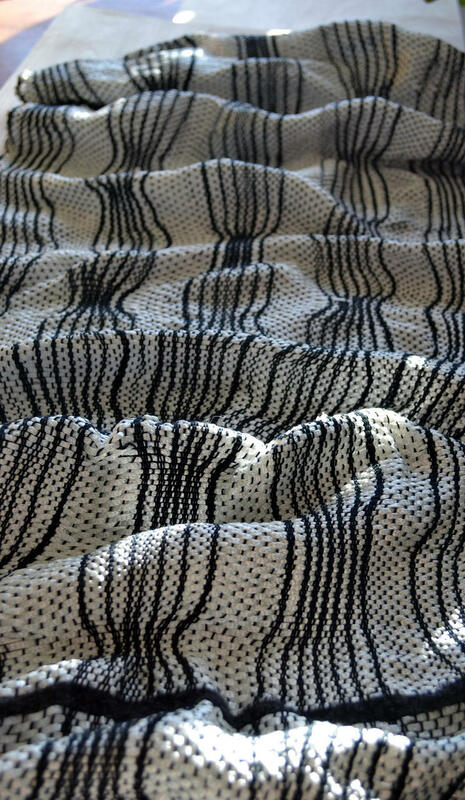 Juula has woven fantastic samples with RailReed, her sense of quality and style is very valuable. Anneli has a soul of a writer but she will be developing wearable garments from the wierd pieces of fabric we produce with RailReed. Tõnis is a person who can grasp the idea, point out the weaknesses and suggest realistic solutions in minutes! Siim is an engineer, who can explain stuff so that everybody understands and he has the rare power to give help so that it is easy to accept. 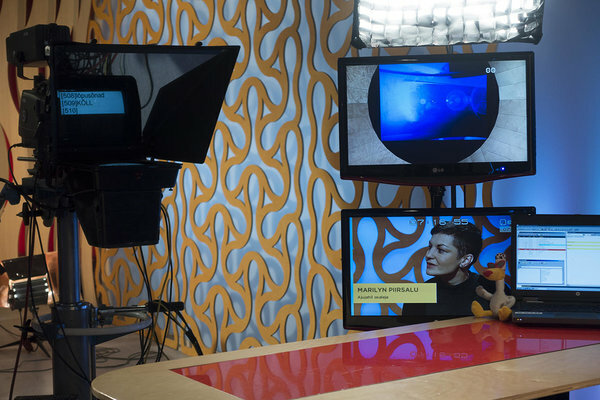 Marilyn is a video artist who can capture small details in life with great warmth and compassion, but besides that she will keep the inventor Kadi focused, when I feel like drifting into inventive dreaming.